On the 3rd day of Christmas, my true love gave to me…a delicious Bacon Bloody Mary Set! Anyone who likes Bloody Marys, will LOVE Bacon Bloody Marys!! This popular gift set includes Bacon Rim Salt, Bacon Hot Sauce & Bacon Flavored Garnish Picks! 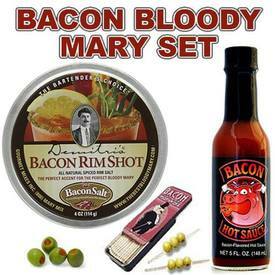 SPECIAL OFFER: Bacon Bloody Mary 3pc Set on sale now...with FREE Priority shipping!